PUNE: Eugeneson Lyngdoh and CK Vineeth scored on either side of the half-time as Bengaluru FC wrapped up their Pune tour with two wins from as many matches and joined Mohun Bagan at the top of the table with 28 points. Just as Bengaluru had beaten Pune FC on Tuesday, the defending champions gave astute display of attacking football in beating Bharat FC 2-0, in the Round 19 match of the Hero I-league football championship at the Balewadi Sports Complex Stadium here on Friday. Though Bengaluru has played two matches more than the league leaders Bagan, the Southern outfit demonstrated that they were not letting go their trophy just as easily. Three points from Bharat FC match took the Bengaluru FC points tally to 28 from 15 matches with a goal difference of 11. Bagan, who take on Pune FC on the morrow here, still occupy the No 1 spot with 28 points from 13 matches and have a goal difference of 13. Bharat FC on the other hand stayed at No 10 position with 12 points, just one point separates them from bottom scrappers Sporting Clube de Goa. Host Bharat FC began with confidence with Romuald Boco creating moves upfront. But the striker from Benin got no support from his fellow forwards while Bengaluru defence stood firm in blocking anything that came towards their post. Finally, the Shillong-born Lyngdoh broke the deadlock in the 29th minute to silence the sparse home crowd. Bharat FC forward Surajit Bose made worst mistake when he lost the ball just outside the box and Sean Rooney chanced on it to set up Lyngdoh some 20 yards from the goal. The Bengaluru medio curled the ball without changing his stride and shot right at the back of the nettings past a hapless second choice Bharat FC goalkeeper Shahinlal Meloly. Stunned by the goal, Bharat FC responded through Subhash Singh, who moved with Surajit and captain Steven Dias, who made a dangerous attack only to see Joshua Walker attempts to clear the ball at the near post. The ball though stayed in play before Shankar Sampangi prevented any damage at the far post. Two minutes from halftime, Bharat FC almost had a chance when Vignesh headed in from 20 yards for Subhash and Dias to make the most of the chance. Subhash Singh reached the ball just in time but Dias, who needed to put the ball in misfired. 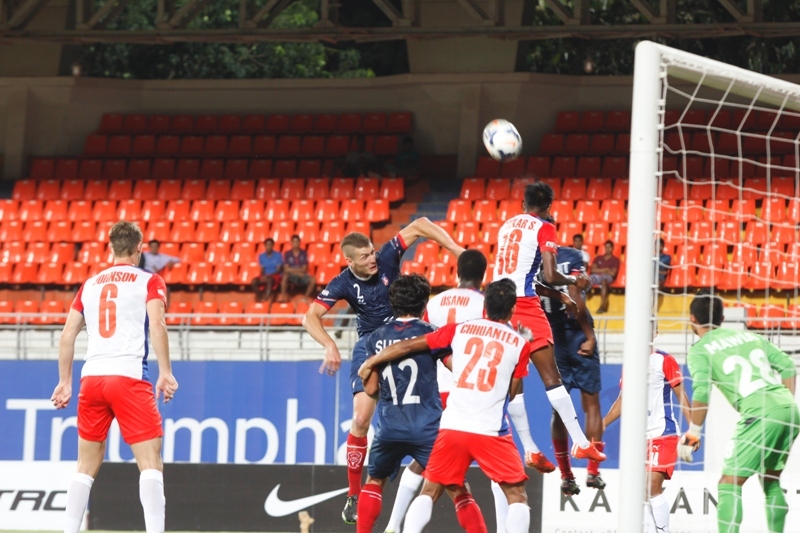 After change of ends, Bengaluru began pushing in through captain Rino Anto, Lyngdoh and Sampangi. And 10 minutes into play it was CK Vineeth who scored his second goal of the week and that too a spectacular one. Australian Rooney had the ball and enough space for him to create a move. Rooney set up Lyngdoh again in the centre of the penalty area. The Shillong boy then crosses the ball for Vineeth, who scores on a flick of his right ankle to stun Bharat FC.